On the heels of Maya Angelou’s death my son’s fourth grade class put on a poetry tea. It wasn’t planned this way. They just happened to transpire in the same week. I’ve never been to a poetry tea. 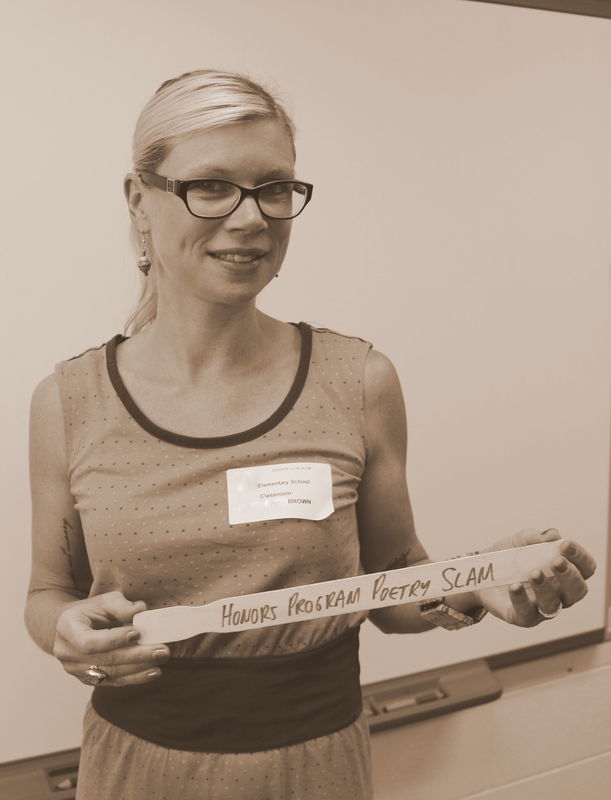 I’ve been to poetry slams, where upon entering everyone is given a paint stick. Instead of clapping or snapping (never really understood that one) you slam the paint stick on the desk in click-clack applause. When my son told me weeks ago they were beginning to study poetry at school I was elated. Finally something I could get excited about. Common Core math is all he seems to bring home and talk about (and fail). I don’t do math. I took remedial math in college because my ACT math score was so low. I used to stab my math book with a pencil on homework nights in middle school. One year I snuck my worn math book home on the last day of school, placed it in the dry creek bed behind our house, and set it on fire. But poetry? I wrote my first poem sometime during elementary school. I’m sure my mom still has it as she has much of my early schoolwork, artwork, and report cards archived. I continued to write poetry into high school. Became the editor of the writer’s group. Won an English award for outstanding achievement. Wrote more poetry in college. Went to more poetry slams. Acquired more paint sticks. My mom even kept one of my poetry slam paint sticks. And brought it to the tea. My son was intrigued. But asked me to please not slam it. It was a dream of mine to become the next great American poet or author. To make money and gain notoriety from what I loved and seemed born to do. That dream among wanting to become a famous actress, a CIA agent, and at one time an astronaut. Now I hate being in front of a camera. Don’t like guns. Haven’t flown in six years. But this writing and poetry thing? Yeah, it stuck. Maya Angelou’s first book I Know Why the Caged Bird Sings was published when she was in her early forties. You don’t have to be young to be an accomplished writer. And you don’t have to be accomplished to write. We do it because we have to. I don’t know what my son will end up being passionate about. Right now he wants to become a firefighter. Or create story lines for video games. I don’t care if he doesn’t get math. Because I get that. Would I love if he were to get into poetry? Sure. But he will do what is in his heart to do. And yesterday at the poetry tea I was very proud of him. For an afternoon we shared a common dream. To express our thoughts from heart to paper to audience and have at least someone moved. ‘Watermelon and salt water’ – he’s well on the way, in my opinion! Thanks, Ron. I love that idea!